Hello new favorite holiday side dish! If you’ve never tried yamples, they are sure to steal your heart. 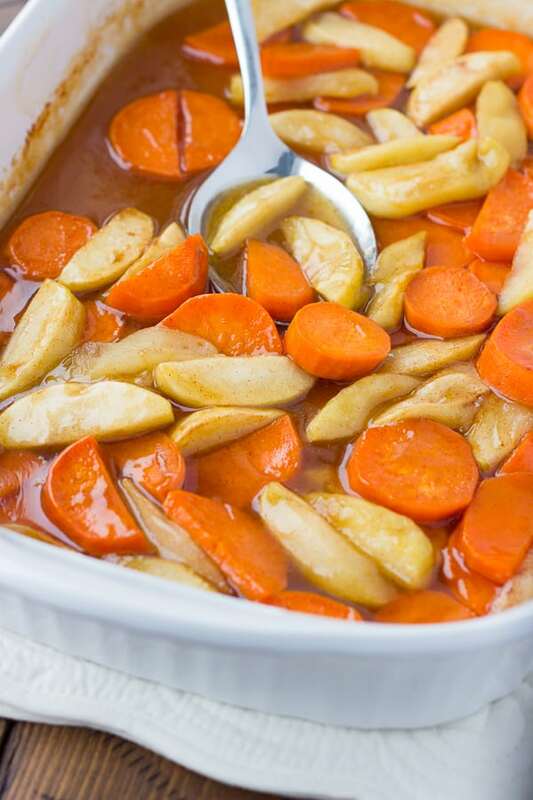 Yamples = Soft, juicy apples + tender roasted yams (sweet potatoes) + a velvety brown sugar sauce. This is a naturally gluten-free, egg-free side that can be easily made dairy-free if you swap out the butter for vegan butter. It couldn’t be easier to make. The sweet potatoes get roasted a little before adding the sauce and apples. Then you mix everything together and bake for an hour. Easy peasy! 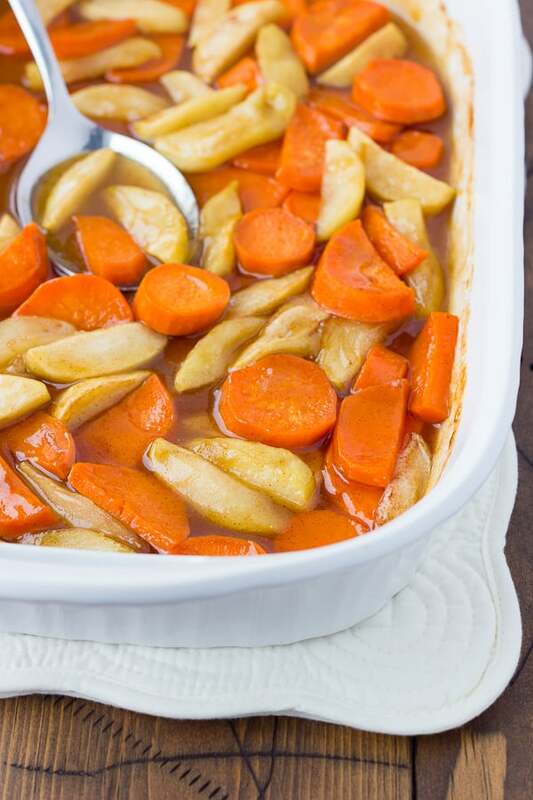 This would be delicious for Thanksgiving, but also great for any other fall or holiday meal. It would be perfect alongside maple-glazed roasted pork tenderloin or slow-cooker turkey breast. Yamples taste like apple pie and glazed sweet potatoes all in one dish. 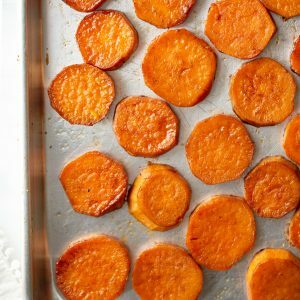 Usually this recipe is my go-to for sweet potatoes throughout the year. My 4-year-old and baby could eat those all day. 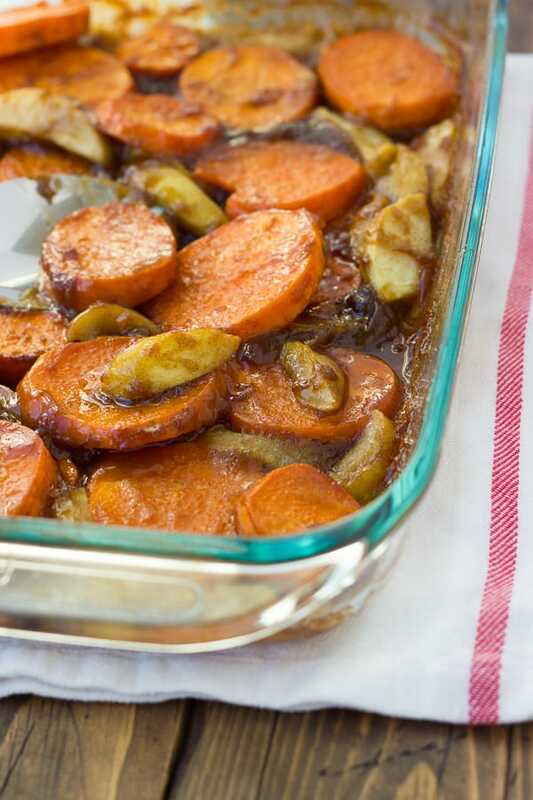 Adding apples and the sauce makes these sweet potatoes extra special. How does navigating food allergies work at your house during the holidays? I know many people read my blog because they occasionally cook gluten-free for a loved one. Others eat gluten-free themselves all the time. My husband and kids eat totally gluten-free with me at home. My side of the family now eats totally gluten-free as well. Since I found out I have celiac disease a few years ago, 2 of my immediate family members also found out they have it! My husband’s family doesn’t eat gluten-free, but they are so understanding and accommodating. It seems like a lot of people go gluten-free these days because it’s a popular trend. I’ve noticed because it is so popular, some people forget there are true health reasons people eat gluten-free. For so many it’s not a food preference, but an absolute medical necessity 365 days of the year. When I first found out I had celiac disease, I felt really self-conscious and inconvenient when people went out of there way to make something gluten-free for me. I was grateful of course, but inside I didn’t like feeling like a problem. I now realize I’m blessed to have family members and friends that truly care. I would never expect someone to make everything gluten-free for me at a holiday gathering, but am grateful and touched when they think of me and include gluten-free dishes. So to everyone eating gluten-free, don’t feel like a problem. You didn’t ask to have food allergies after all. And to everyone cooking gluten-free for a family member, you’re a rockstar! It really makes the holidays special when everyone can enjoy food together! Preheat the oven to 400 degrees. 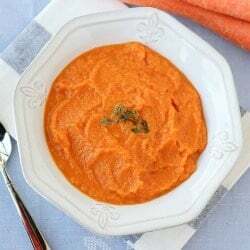 Toss the sweet potatoes with 1/2 tablespoon oil and sprinkle with 1/4 teaspoon salt. Place in a 9×13 pan. Roast for 15 minutes. Whisk together the ingredients for the sauce. Add the sauce mixture and apples to the sweet potatoes and stir. Roast for another hour, until the sweet potatoes and apples are soft and the sauce is bubbly. Serve warm. Enjoy!